First, Ronald McDonald was beheaded with a brick paver. The following night, someone sawed off his feet with a hacksaw. For nearly a decade, the life-size figure, clad in his signature mustard-yellow jumpsuit over red-and-white striped undergarments, had sat on a wooden bench in the playground outside Burlington's Ronald McDonald House. It's not the first time he's fallen victim to vandalism — someone burned his face with a lighter in August — but this time the damage appears irreparable, and he's been removed from the bench. Were the vandals, who struck two weeks ago, attempting a political statement against the interminably controversial corporate restaurant chain? If so, they picked a poor target, according to Kristine Bickford, executive director of the Ronald McDonald House Charities. Since 1984, the charity has provided temporary lodging and meals to families with children receiving medical services from the University of Vermont's Children's Hospital. People can stay at the former church parsonage on the corner of South Winooski and Pearl streets for $10 a night. It wasn't until former guests started telling Bickford stories that she realized the inanimate clown had been a source of entertainment and comfort to young kids, many of whom are battling life-threatening illnesses. Bickford shared a letter written by Emily May, a woman who spent two months with her family at the house during a high-risk pregnancy. Addressing the vandals, May wrote, "You entered a haven for the desperate, and your actions affect the most vulnerable." The letter goes on to describe her 3-year-old daughter visiting the figure throughout their stay. "My daughter greeted that clown through the snow, each time she entered the house... Several months after delivery, thanks to the amazing care of cautious doctors and a whole lot of luck, we were able to return for my daughter to celebrate the lives of her mother and baby sister on that playground." 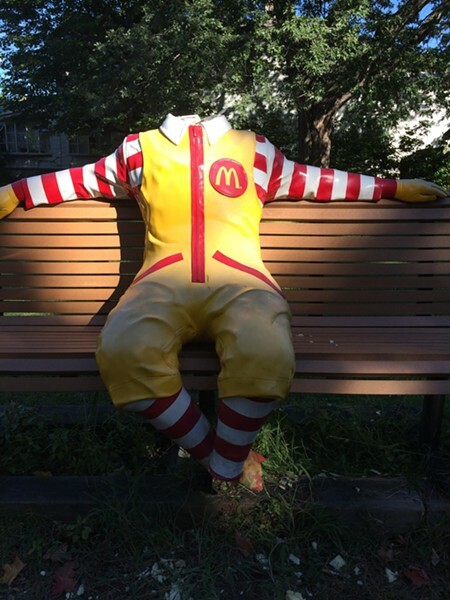 Ronald’s severed head was recovered near Skinny Pancake. 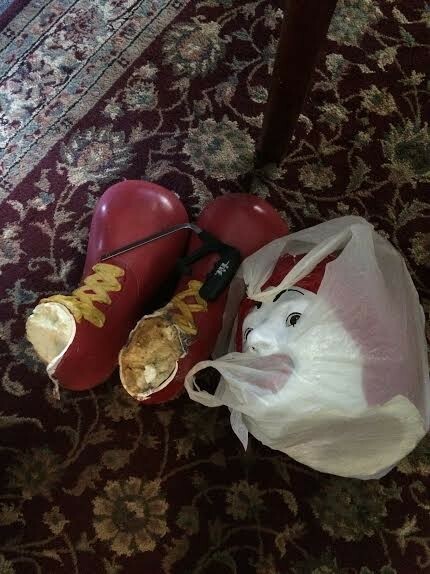 Three children staying at the house happened upon his bulbous red boots. "They were somewhat traumatized seeing Ronnie this way," Bickford said. The executive director looked into buying a replacement, but at a cost of $4,000, it's likely contingent on an insurance claim. This is not the only recent incident of bizarre vandalism. Last weekend, vandals dislodged two 300-pound sphinxes in artist Leslie Fry's Winooski sculpture garden.